Auburn is a city in the Finger Lakes region of New York. The best way to get to Auburn is definitely by car, though visitors can also take one of five city bus routes via Centro bus system. Auburn has a population of 29,581 people according to the 2000 U.S. Census, and is 25 miles west of Hancock International Airport in Syracuse. Syracuse Hancock International Airport (SYR IATA), Colonel Eileen Collins Blvd. Syracuse, Phone: +1 315 464-4330, . Greater Rochester International Airport (ROC IATA), 1200 Brooks Av, ☎ +1 585 464-6000. Rochester. New York State Thruway (Interstate 90), Exit 40. Route 34 South to Auburn. The nearest Amtrak station is in Syracuse at the William F. Walsh Regional Transportation Center, located at 131 Alliance Bank Parkway just north of downtown Syracuse. Amtrak, . Syracuse is served twice daily in each direction by the Empire Service (New York City to Niagara Falls), once daily in each direction by the Maple Leaf (New York City to Toronto, following the route of the Empire Service up to Niagara Falls), and once daily in each direction by the Lake Shore Limited (New York City or Boston to Chicago, following the route of the Empire Service up to Buffalo-Depew). The nearest bus station is also in Syracuse at the William F. Walsh Regional Transportation Center. Please note that Greyhound, Trailways and Megabus do not go into Auburn. You will have to then take a Centro bus into Auburn. Greyhound, . Service from New York City (via Scranton, Binghamton, and Cortland), Boston (via Worcester, Springfield, Albany, Schenectady, and Utica), and Cleveland (via Erie, Buffalo, and Rochester). Trailways of New York, . Service from Buffalo (via Rochester) and New York City (via Scranton, Binghamton, and Cortland). Megabus, . Service from New York City and Rochester. Centro, ☎ +1 315 253-5765. Any Taxi Service, ☎ +1 315 252-2222. Deluxe Taxi Cab, ☎ +1 315 253-3333. JMJ Taxi, ☎ +1 315 252-5004. Enterprise Rent-a-Car, ☎ +1 315 253-4004. 42.9308-76.568411 Auburn Historic Sites Commission, 131 Genesee Street, ☎ +1 315 258-9820. 42.9276-76.57523 Cayuga Museum of History and Art and Case Research Lab, 203 Genesee Street, ☎ +1 315 253-8051. Housed in the Willard-Case mansion (built in 1836), the museum offers exhibits on local figures, events and items pertinent to the development of Cayuga County. The Case Research Lab is the site where the first successful system of sound on film was invented. Theater Mack, located in the historic carriage house, hosts lectures, events and Finger Lakes Musical Theatre Festival productions. Gift shop offers local memorabilia. 42.9244-76.57134 Fort Hill Cemetery, 19 Fort Street, ☎ +1 315 253-8132. Set on a hill overlooking Auburn, this site was used for burial mounds by Native Americans as early as 1100 A.D. It includes the burial sites of William Seward, Harriet Tubman, Martha Coffin Wright, Col. Myles Keogh who fought with Gen. Custer at the Battle of Little Big Horn, and a monument to Indian orator Chief Logan. 42.91152-76.563775 Harriet Tubman Home, 180 South Street, ☎ +1 315 252-2081. Known as "The Moses of Her People," Tubman settled in Auburn after the Civil War and operated this home for the aged and indigent blacks. As a conductor on the Underground Railroad - a network of abolitionists that helped slaves escape to freedom - she made a dozen trips south over a period of 11 years. Tubman died in 1913 at her South Street property, and is buried at the Fort Hill Cemetery. 42.9295-76.56666 Seward House Museum, 33 South Street, ☎ +1 315 252-1283. For over 50 years, the Seward House was the home of William Henry Seward (1801-1872), Governor of New York, United States Senator, Secretary of State to Presidents Lincoln and Johnson, and a leading figure in the Republican Party and the purchase of Alaska. Guided tours through all 17 rooms at this registered National Historic Landmark are available. 42.9286-76.57137 Seymour Public Library, 176-178 Genesee Street, ☎ +1 315 252-2571. On the National Register of Historic Places, this monumental stone building was designed by the New York City firm, Carrere and Hastings, designers of the New York Public Library. 42.93701-76.56368 Willard Memorial Chapel, 17 Nelson Street, ☎ +1 315 252-0339. Designed by Louis C. Tiffany and Tiffany Glass and Decorating Co., one of the few unaltered Tiffany chapels known to exist. Available year-round for weddings, concerts and special events. Adults $8. 42.9309-76.5671 Auburn Public Theater, 8 Exchange Street, ☎ +1 315 253-6669. At Genesee, A presenting and production company offering plays, comedy acts, fine arts shows, dance, film and musical productions. The space includes a main stage, cabaret stage and cinema. 42.9036-76.5372 The Merry-Go-Round Playhouse, 6877 E Lake Rd, ☎ +1 315 255-1785. Bills itself as Broadway in the Finger Lakes. Located in Auburn's Emerson Park. 42.9412-76.5333 Highland Golf Course, 3068 Franklin Street, ☎ +1 315 253-3381. Road, 18 holes, pro shop, carts, lessons, food, 7am - 9pm, par: 71, yards: 6400. 42.905-76.5384 Emerson Park, 6914 East Lake Road, ☎ +1 315 253-5611. Emerson Park includes 135 acres located at the northern end of Owasco Lake with one mile of lake front and two miles of river front. The park features boat launches, boat slips, a disc golf course, playground, and picnic shelters. Activities include strolling along the waterfront and restored seawall, swimming, picnicking and dog walking in designated areas. 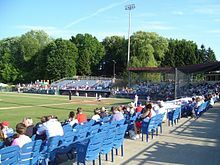 Emerson Park is the home of Auburn Little League, Merry-Go-Round Playhouse, the historic Emerson Park Pavilion and many annual events. 42.9415-76.58535 Auburn Doubledays, 130 N Division St, ☎ +1 315 255-2489. Farm team for the Washington Nationals baseball team, June–September. 42.934-76.56991 Curley's, 96 State Street, ☎ +1 315 252-5224. Has been serving American food since 1934. 42.9333-76.56372 Moro's Table, 1 E. Genesee Street, ☎ +1 315 282-7772. Tuesday - Saturday, seating from 5-9PM. Enjoy amazing food in a relaxed atmosphere. 42.931-76.5681 A.T. Walley & Co., 119 Genesee Street, ☎ +1 315 282-7314. 42.9348-76.56692 McMurphy's Authentic Irish Pub & Restaurant, 75 North Street, ☎ +1 315 253-4531. 42.899-76.55063 Oak and Vine at Springside, 6141 West Lake Road, ☎ +1 315 22-7247. 42.93095-76.568264 Parkers, 129 Genesee Street, ☎ +1 315 252-6884. 42.9315-76.56595 Swaby's, 6 South Street, ☎ +1 315 252-5400. 42.9226-76.58356 The Auburn Ale House, 288 Genesee Street, ☎ +1 315 252-2337. 42.9222-76.56731 10 Fitch, 10 Fitch Ave, ☎ +1 315 255-0934. Luxurious, romantic, inn. 42.9001-76.58322 A Wicher Garden Bed & Breakfast, 5831 Dunning Ave, ☎ +1 315 252-1187. Road. 42.928-76.56683 Days Inn, 37 Williams Street, ☎ +1 315 252-7567. 42.9335-76.56884 Hilton Garden Inn, 74 State Street, ☎ +1 315 252-5511. In downtown Auburn. 42.9349-76.56735 Holiday Inn, 75 North Street, ☎ +1 315 253-4531. 42.9343-76.56236 Inn at the Finger Lakes, 12 Seminary Ave, ☎ +1 315 253-5000. 42.8986-76.52637 Lakeside Bed and Breakfast, 79 Lakeshore Dr, ☎ +1 315 730-3643. 42.9381-76.51548 Sleepy Hollow Motel, 3401 E. Genesee Street, ☎ +1 315 604-8009. Road. 42.8989-76.55089 Springside Inn, 6141 West Lake Rd, ☎ +1 315 252-7247. On the North end of Owasco Lake. They have newly renovated rooms and a restaurant. 42.9318-76.573910 Super 8, 19 McMaster Street, ☎ +1 315 253-8886. 42.9288-76.563811 Tuxill House, 5 Tuxill Square, ☎ +1 315 252-0055. This city travel guide to Auburn is a usable article. It has information on how to get there and on restaurants and hotels. An adventurous person could use this article, but please feel free to improve it by editing the page.